Admire the reflection of the trees and the mountains mirrored in the lake. The town of Puigcerdà sits on a plateau in the sunny valley of Cerdanya in the Spanish Pyrenees, neighbouring France. 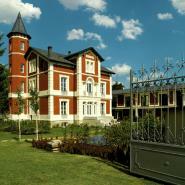 This scenery of refreshing mountains, snow, woods and the tranquil lake of the city frames the Villa Paulita mansion. Originally a private vacation home, the Villa Paulita is now an enchanting hotel that resulted from a project intent on preserving the spirit of the place, bringing together the antique and new, and recovering its eclectic French style architecture.The old building is almost symmetrical with a prominent watchtower. On the ground floor there is the reception and a comfortable sitting room with a fireplace. The rooms incorporated into the next two floors are adapted to the diverse styles of the building’s structure.On the other side of the garden, and in the former stables area, an annex of rooms in keeping with the character of the rural buildings emerged. The rooms at ground level have small private patios and those on the upper floors have ample windows that invite the landscape inside.At the restaurant, an avant-garde menu with traditional flavours and regional products can be appreciated while being in awe of the panoramic view on the lake. At the SPA, you should not miss the interior pool, the fitness areas or the treatments and massages to recharge your batteries in refinement.